Nicola Antonio Porpora was one of the main composers of operas and cantatas of the mid-18th century. His fame brought him to several places in Europe, such as Vienna, Dresden and London. In the latter city he became one of the main rivals of Handel, composing music for the stage for the Opera of the Nobility. He also worked for some time in Venice, but he died in Naples, the place of his birth. Apart from being famous as a composer, he was a reputed singing teacher. Among his pupils were some of the most celebrated castratos, Farinelli and Caffarello. A look at the work-list in New Grove reveals that the instrumental part of his oeuvre is negligible. It seems that the sonatas which are recorded by Adriano Maria Fazio and his colleagues are not included in that list. The title page of this disc mentions another name: Giovanni Battista Costanzi. He was from a later generation and was born in Rome. There he worked all his life and enjoyed the patronage of Cardinal Ottoboni. He was educated as a cellist, but although his extant oeuvre includes some music for his own instrument he was especially famous for his vocal works, first secular dramatic compositions, later religious music. On the title page these sonatas are announced as cello sonatas. Strictly speaking that is not correct; the fact that the ensemble includes a violin points in that direction. Actually these sonatas are trio sonatas for violin, cello and bc. However, they are different from what one probably expects from a trio sonata. In the oeuvre of Pietro Antonio Locatelli - contemporary of Porpora - one also finds a trio sonata for the rather unusual combination of violin and cello, but these are treated in a different way. In these sonatas by Porpora the two instruments don't play that often together. There is hardly any counterpoint, as one would expect in trio sonatas. It is mostly one of the instruments which starts the proceedings in a movement, and after a while the other instrument takes over, often imitating phrases of the previous instrument. Some slow movements are for the cello alone, without any participation of the violin. The structure of these sonatas is the classical Corellian model: four movements in the order slow - fast - slow - fast. But that is where the similarity stops. Especially in regard to the connection between the two instruments these sonatas are highly unusual. That makes this disc a worthwhile addition to the discography. It is very disappointing that the liner-notes give so little information about things one would like to know. We are only told that Costanzi "made his technique available to the author [of these sonatas], in order for the notation to be suitable for his instrument". That's all. The entries on Porpora and Costanzi in New Grove are of no help. It is notable that in the article on Porpora Costanzi is not mentioned at all; in fact, Porpora's instrumental works are completely ignored in the discussion of his output. At the same time, Porpora is not mentioned in the article on Costanzi. What was Costanzi's role: did he give only technical information or did he have any part in the compositional process? 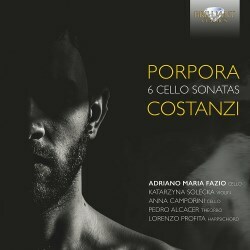 Did Porpora compose these sonatas especially for Costanzi? Considering that the latter worked all his life in Rome it seems likely that they have met there. Were the sonatas written before Porpora's stay in London? It is interesting that Porpora, when he was in London, composed cantatas for the Prince of Wales who was an avid player of the cello. This explains why they include obbligato cello parts and that could be an indication that Porpora and Costanzi met before the former went to London. The lack of information is a serious shortcoming. Not only do the liner-notes fail to provide the listener with substantial information about the connection between the two composers, there is not much about the music itself either. In addition, the liner-notes are so badly translated into English that they are sometimes hardly intelligible. Fortunately the performances are much better. Adriano Maria Fazio is a very fine player who deals well with the virtuosity of the fast movements and the cantabile character of the slow movements. Katarzyna Solecka is his equal partner at the violin. Because of the unusual texture of these sonatas as well as the engaging performances by these artists this disc is well worth investigating.